Upon arrival, you will board your Mango Cruises boat at Chuong Duong Pier in My Tho and head to An Hoa River. Enjoy your welcome drink and peaceful scenery while crew members board your luggage. The cruise will take you to Phong Nam village in Giong Trom, where you will take the cycling trip through the Village to explore more of the local daily life. Stop at a local house to taste the tropical fruits and chat with the farmer. Visit the rice noodle factory which supplies to most local markets in the area. Row through these canals until you head back to the big river where your sampan is awaiting for you and lunch will be served on board. Get back on the boat and continuing to cruise to Con Oc, the island which is famous with coconut products. Take the bicycle to Ms Dung house, her family has been well-known of making handicrafts from coconut shell. Have a chat with the locals and get back to your boat to enjoy the sunset in the late afternoon. Our staff will then prepare your cooking demonstration and dinner on board. The rest of the evening will be spent at your leisure. Overnight at Vam Nuoc Trong canals. In the morning, breakfast will be served on board before starting to explore the Mo cay wet market. Then continue to visit the coconut processing workshop where you can see how the locals utilize every bit of the coconut. Take the biking trip along the canals to the village to explore more of the local life. After that resume your cruise, refresh and prepare to check out for your onward trip or return to Saigon. You will be dropped off at Mo Cay Bridge. 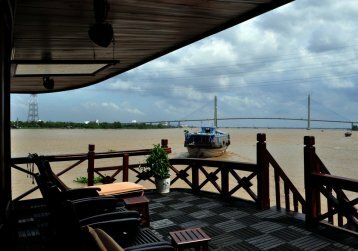 Upon arrival, you will board your Mango cruise boat at Ba Dung pier and head to An Hoa River. Enjoy your welcome drink and peaceful scenery while crew members board your luggage. 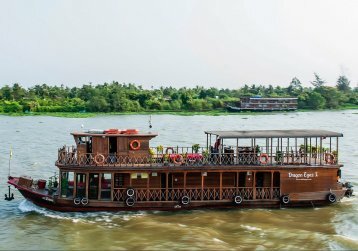 The cruise will take you to Phong Nam village in Giong Trom, where you will take a rowing sampan boat through the small canals, which are covered green by the water coconut plants. Overnight will be spent on board on the Co Chien River. In the morning, breakfast will be served on board before starting to explore the town of Vung Liem by bicycle. Visit the Happy Buddha Temple, a beautiful and characteristic Khmer Temple of this small town. After that continue to visit the Cao Dai Temple in one of the most popular local religions, which is a combination of Taoism, Buddhism and Confucism. After that get back to the cruise and refresh, check out and you will transfer to Vung Liem Market where your driver is waiting for you to take you back to Saigon or continue your onward trip. The tour ends at 10 AM. After your visit, take a short walk to Mrs. Huong’s house, who lives with her 3 children and grandson – they live on fishing, shrimp and fruit orchards. Enjoy fresh fruits and tea in her garden and then board a rowing sampan, taking you through a lush narrow canal, displaying the tranquil nature of the region. Then rowing you back to your Mango boat to enjoy the lunch before continuing to cruise to Sa Dec town. On the way stop at local village and begin cycling, enjoying the peaceful scenery and quiet road pathways. The boat will then cruise to Tra On on the Mang Thit river, on the way you will stop at Cai Nhum village where you will have a walk or bike ride through local villages and this will offer a good chance to observe the local culture and interact with the local people. Living room/2nd bedroom with A/C and an open dining area off the back. Free Wi-Fi connectivity is provided on each of our overnight sampans. Surcharge US$33 per person from Feb 4 to Feb 7, 2019 on Lunar New Year.